As the Freddie Mercury biopic “Bohemian Rhapsody” begins, we watch the Queen frontman heading to the stage. We see only the back of his white tank top, light wash Wrangler jeans and a leather studded armband as he makes his way to perform at the Live Aid concert in 1985. But the first time we see all of Mercury, it’s 1970. Queen is yet to be conceived, and Mercury — known then as Farrokh “Freddie” Bulsara — is working as a baggage handler at Heathrow Airport. And thus begins the story of the lead singer and his band whose infamous six-minute single continues to rock the music scene. 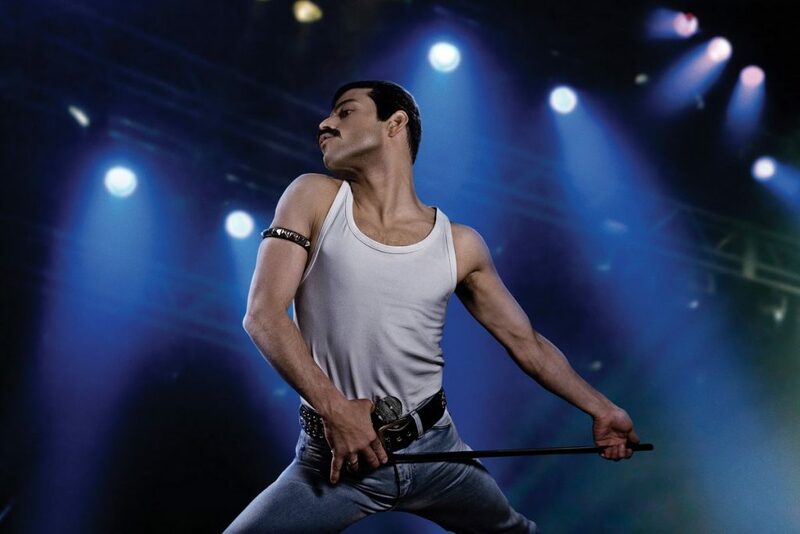 Directed by Bryan Singer, with production credits of band members Brian May and Roger Taylor and manager Jim Beach, “Bohemian Rhapsody” stars Rami Malek as Freddie Mercury in his freshman days of music leading up to the epic performance at Live Aid. Malek makes deliberate choices in his portrayal of the flamboyant and lively Mercury. From the close-lippedness hiding his four extra incisors — which he proudly claims benefit a wider vocal range — to the way he holds half of his microphone stand and dances on stage, Malek is gone, and Mercury is in his place. The film details Queen’s early years, beginning with Mercury’s family questioning his new persona as the rock band begins to take off with an American tour. The concept of identity — musical, gender, sexual or otherwise — is recurring as Mercury comes to his own in the world. We meet his lover Mary Austin, portrayed by Lucy Boynton, and we follow their bumpy love story as Queen’s popularity grows. What stood out the most to me was the camaraderie of the band members. We watch drummer Roger Taylor (Ben Hardy), lead guitarist Brian May (Gwilym Lee), bass guitarist John Deacon (Joseph Mazzello) and Malek as Mercury during songwriting and recording sessions. As frustrating as the artistic process could be, the members always emphasized that they were a family. I found it refreshing how these members fought for their music and for each other. Through the highs and lows of the band’s dynamics and his own struggle with various interpersonal relationships, we see that Mercury lived his life for the music. Though some parts of the story were fictionalized for the film, Malek’s portrayal was honest and moving. I felt like I got to know more about who Mercury was as a performer and as an ordinary person. Despite a struggle with AIDS that led to his death in 1991, this film shows Mercury putting on a show until the very end. “Bohemian Rhapsody” is in theatres now.